In late July, 2013, the FDA issued a powerful “black box” safety warning for a drug which has been taken by hundreds of thousands of troops to prevent malaria. The drug is called mefloquine, and it was previously sold in the U.S. by F. Hoffman-La Roche under the trade name Lariam. 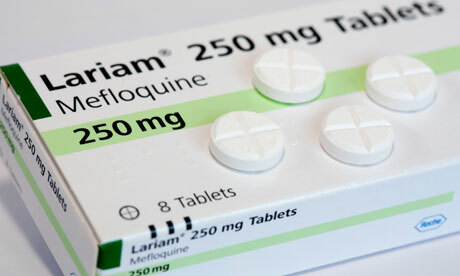 Since being developed by the U.S. military over four decades ago, mefloquine has been widely used by troops on deployments in Africa, Iraq and Afghanistan. We now recognize, decades too late, that mefloquine is neurotoxic and can cause lasting injury to the brainstem and emotional centers in the limbic system. As a result of its toxic effects, the drug is quickly becoming the “Agent Orange” of this generation, linked to a growing list of lasting neurological and psychiatric problems including suicide. This entry was posted in Department of Defense, Military Policy, Suicide, Violent Crime and tagged 2013, Fort Bragg, Homicide, Mefloquine, Suicide, US Army by Jennifer Norris. Bookmark the permalink.